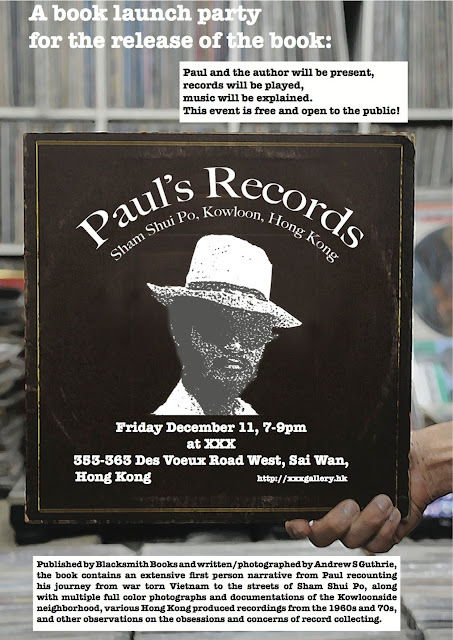 Finally, after a long interim, Pitch Yr Culture returns as part of the launch for the book "Paul's Records: How a Refugee from Vietnam Found Success Selling Records on the Streets of Kowloon"
Nick Langford, who came to HK in 2005 with a financial institution but left banking in May of this year; he then started the online record store Vintage Vinyl. The first records he sold were a bunch of Rolling Stones' albums. Kacey Wong, an award winning Hong Kong born and based artist who has exhibited locally and internationally in both museums and galleries. He is also a founding member of Art Citizens and Street Design Union which investigate artist’s and designer’s role in social political causes. Patricia Choi, cultural impresario, interior architect and entrepreneur who owns and operates the art hostel Wontonmeen in Prince Edwards. Shelf-index, a member of the Hong Kong based DJ collective Synch Sing Sin, the band Gravity Alterstra and a Director at Hobbyhub Entertainment.